For humans, that means better beach days and much needed vacations, but for your animals, the warmer weather can be dangerous. Even the healthiest pets can suffer from dehydration and heat exhaustion, so it’s important to take proper precautions and protect your pets from overheating. By following a few simple steps, you can help keep your pets safe and comfortable all summer long. First things first, it is highly recommended that you schedule a visit with your vet for an early summer check-up and ask your doctor about flea and tick prevention. Have your pet tested for heartworm if they are not currently on year-round prevention medicine. Use these four tips throughout the warmer months to protect your favorite four-legged friends. During the summer months, it’s best to be cautious of how long your pet spends in the sun. Being outside is a great way for your pets to be physically active. However, you may consider only letting your pets out during the cooler parts of the day. While humans can wear shoes, your pet’s feet are not protected against the hot ground, so it’s important to limit their exposure. Never leave your pets alone in parked vehicles. Even with the windows down, the temperature in a car can quickly reach over 100 degrees Fahrenheit, regardless if it’s left in sun or shade. These temperatures can cause your pet respiratory distress and, potentially, serious harm. 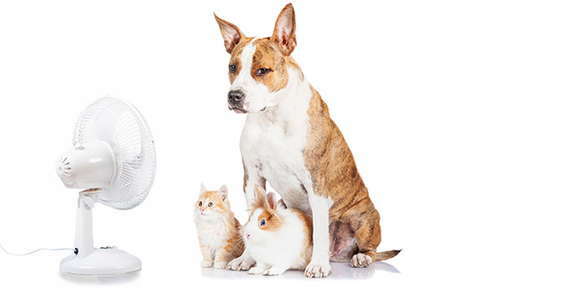 Leave your pets where they have access to cool, shady spaces and plenty of water to keep them comfortable. Hydrate, hydrate, hydrate. While many animals use panting as a method to cool down, panting evaporates fluid from your pet’s respiratory tract. If your pet has been playing, exercising or has spent some time directly in the sun, it’s especially important to replace these fluids with enough clean drinking water throughout the day.